I’ve just released a new PFF white paper looking at the hysteria that has often accompanied major media mergers and then taking a look at the marketplace reality years after the fact. Here‘s the PDF, but I have also pasted the entire thing down below. Although the pending union of Comcast and NBC Universal has not yet made it to the altar, Chicken Little-esque wails about the marriage have already begun in earnest. For example, the pro-regulatory media organization Free Press has already set up a website to complain about the deal. And Jeff Chester, executive director of the Center for Digital Democracy, has called it “an unholy marriage.” The fever only promises to spread once the deal is formally announced, and a lengthy fight over the deal is expected at the Federal Communications Commission (FCC) and whichever antitrust agency reviews the deal. But reality tends to play out somewhat less dramatically than the script penned by the media worrywarts. It’s worth looking back at some of the more prominent examples of media merger hysteria in recent years to understand why such panic is unwarranted, and why a deal between Comcast and NBC Universal is unlikely to lead to the sort of problems that the pessimists suggest. Such pessimistic predictions proved wildly overblown. To say that the merger failed to create the sort of synergies (and profits) that were originally hoped for would be an epic understatement. The titles of two popular books about the deal summed up the firm’s troubles: One was entitled Fools Rush In (by Nina Munk) and the other, There Must Be a Pony in Here Somewhere (by Kara Swisher and Lisa Dickey). The day the deal was announced, Jan. 10, 2000, Time Warner closed at the equivalent of $184.50 a share. After almost 10 years of travail, the $184.50 has shrunk to about $42.25, consisting of one Time Warner share and a quarter of a Time Warner Cable share. The 77 percent decline is triple the decline in the Standard & Poor’s 500-stock index over the same period. And the Time Warner-AOL split wasn’t the end of this messy divorce process. In 2008, Time Warner Cable and Time Warner Entertainment decided to split. Time Warner has even spun off some of its oldest properties. In 2006, it announced that it was putting 18 of the 50 magazines in its Time magazine division up for sale. As is always the case, these divestitures and down-sizing efforts garnered little attention compared with the hullaballoo and hysteria that accompanied the announcement of the deal back in 2000. Murdoch will use DirecTV as a ‘death star’ to force his programming on cable companies by threatening a price war unless they give Fox favorable access. Since News Corp will control cable TV’s principal multichannel competitor, it will easily create new channels—unlike anyone else in the TV business. Rather than engage in open combat and competition, cable powerbrokers such as Comcast and AOL-Time Warner will likely accommodate Murdoch and add his new channels to their own services. Imagine Fox News on steroids. Worse, with DirecTV’s capacity to ‘spotbeam’ channels to serve distinct communities, localized versions of Fox programs could be available in major cities across the nation. Imagine the horror of new, “spotbeamed” local media competition! However, unlike the destruction of the planet Alderaan by the Death Star in Star Wars, no one was harmed in the making of the News Corp-DirecTV marriage. Indeed, the rebels would get the best of Darth Murdoch since his “Digital Death Star” was abandoned just three years after construction. In December 2006, News Corp. decided to divest the company to Liberty Media Corporation in an effort to win back more controlling News Corp. stock. Ironically, many of the same groups that had vociferously protested the original News Corp-DirecTV deal again found reason to complain when the deal was being undone! The FCC’s failure to implement various restrictions as part of the license transfer, they claimed, would “result in continuing control by News Corp. over content distribution, harming competition in both the programming and distribution markets, reducing consumer choice and raising cable prices.” Unsurprisingly, little mention was made of the previous round of pessimistic predictions or whether there had ever been any merit to the lugubrious lamentations of the media critics. Sirius-XM: “Merger to Monopoly” or Prelude to Bankruptcy? Some of the most entertaining and wrong-headed predictions about the future of the media marketplace often come from media moguls themselves. For example, back in 2003, when he was still President and Chief Operating Officer of Viacom, Mel Karmazin said in reference to Microsoft, AOL Time Warner, and Comcast: “I can’t imagine being a competitor with any of these guys.” Just six years later, however, plenty of others are competing with those companies. Microsoft finds itself in a heated war with Google on all fronts, AOL-Time Warner has fallen apart, and Comcast is squaring off against telco (e.g., Verizon’s FiOS and AT&T U-Verse) and online video competitors (e.g., YouTube, Hulu) that were unfathomable in 2003—not to mention the traditional satellite TV competitors they still face. Meanwhile, Karmazin abandoned Viacom and is now struggling to find a way to make subscription-based satellite radio survive the ongoing digital music bloodbath caused by the rise of online music services and a little thing called the iPod. In the end, the merger took an astonishing 500-plus days for the FCC to finally approve and was conditioned with a lengthy set of “voluntary concessions” to supposedly rectify these potential harms—including pricing constraints that could limit the firm’s ability to cover costs and pay down debt over time. Whether Melvin’s dour forecast for satellite radio proves accurate remains to be seen. What’s clear, however, is that the fears bandied about by critics when the Sirius-XM deal was pending have not come to pass. Today, however, the Journal keeps humming along and continues to produce some of the finest journalism on the planet. Meanwhile, “politics, art and culture” seem largely unaffected by the deal—either in New York or the nation. And the deal certainly hasn’t made Murdoch or News Corp. any richer. “His purchase of The Wall Street Journal is widely seen as one of the worst moves of his career,” notes Michael Wolff of Vanity Fair. News Corp. has already taken a whopping $3 billion write-down on the deal. Considering the $5 billion price tag Murdoch paid two years ago, one wonders if he’ll hold on to this property any longer than he did DirecTV. No doubt we’ll soon be hearing many of these same apocalyptic predictions about the Comcast-NBC deal. Free Press has said the new entity “will have an incentive to prioritize NBC shows over other local and independent voices and programs, making it even harder to find alternatives on the cable dial.” And Free Press Executive Director Josh Silver has called for the Obama Administration to block the deal saying “it would further starve Americans of [media] diversity.” Even competitors are complaining. Liberty Media Corp. Chairman John Malone, which owns DirecTV, has suggested that they might push the government to reject the deal. Many other rivals will likely join that bandwagon. These critics will likely raise vertical integration fears and claim that Comcast will act as a “gatekeeper” by limiting the ability of independent voices to get a slot on cable distribution systems, or by withholding NBC-Universal content from other platforms and providers. But there’s little historical evidence that suggests this will be a problem. 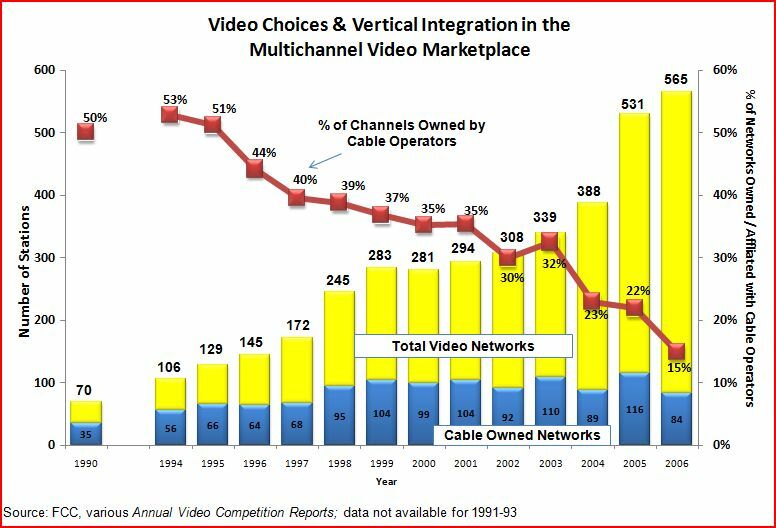 As the adjoining exhibit illustrates, the overall number of video programming channels available in America has skyrocketed, from just 70 channels in 1990 to 565 channels in 2006, the last year for which the FCC has made data available. It is difficult to imagine that Comcast would buck these trends and begin restricting independent options on its systems or withhold its content from others. Video distributors don’t make money by restricting choice. Consumers would flock to alternative video providers and media services if Comcast played such games. The great thing about the modern media marketplace is that there is always another place for consumers to turn to find something they want. Sports programming could be an exception to the rule, and is the one issue that Comcast may need to bargain over with FCC regulators or antitrust officials since they own regional sports networks that other video distributors want access to. But traditional concerns about access to over-the-air broadcast signals (namely, the NBC local broadcast television properties) shouldn’t be as much of an issue today as it was the past. Frankly, local broadcasters need all the eyeballs they can get these days. Thus, it’s unlikely that Comcast would try to withhold those stations from other video distributors, especially since a great deal of NBC programming is already available through other means. And intense competition exists for some of the most important news and informational services that NBC offers, such as local news, weather, and traffic. Comcast understands that the price point for distributing TV into homes is going to fall dramatically in the coming years. Comcast’s 3 distribution products, Voice – TV – Internet, are collapsing into just one, single product: Internet. This poses a huge threat to Comcast’s top line. As such, Comcast is hedging through diversification into content, moving up the media value chain. Comcast will be looking to replace lost revenue in distribution with revenue from content (advertising, subscriptions, etc). This would be a merger, after all, of two businesses that seem headed toward some combination of the fates of newspapers, music CDs and the old wireline telephone business. Customers want the product for free. Comcast’s lifeblood, the $100-a-month cable bill and the $50-a-month broadband bill, increasingly look like duplicative expenses. And so on. True, the number of households that have actually dropped their cable subscriptions in favor of subsisting on TV streamed or downloaded from the Internet is not yet large. But for the Roberts family and its Comcast property, their worst fears lurk just around the corner—being reduced to a “dumb pipe,” subject to commodity pricing while somebody else (Google) makes all the money. Yet an escape route is vexingly hard to envision. Time Warner and Comcast have been talking up plans to make their respective cable lineups available by computer—as long as you keep paying your cable bill. This is a stopgap, especially appealing to anyone who owns two homes but wants to pay only one cable bill. Never mind, too, that hundreds of shows are already available online for free, via Web sites operated by none other than Comcast and the TV networks themselves. In light of such technological upheaval and marketplace uncertainty, it’s important that regulators proceed cautiously when reviewing this deal or future deals. The point here is not that media mergers are inherently good or always make sense. Indeed, as the examples discussed above illustrate, mergers sometimes prove to be huge blunders. But the hysteria sometimes heard before media mergers are consummated rarely bears any relationship to reality once the deals move forward. Media markets are extremely dynamic and prone to disruptive change and technological leap-frogging. Mergers are often one response to that turbulence. But mergers are no panacea, and they often fail to produce the “synergies” hoped for. A 2004 survey by McKinsey & Co. found that “Nearly 70 percent of the mergers in our database failed to achieve the revenue synergies estimated by the acquirer’s management.” Perhaps, therefore, the best argument for blocking media mergers is not their potentially pernicious effect on markets or consumers, but rather to save the merging firms (and their stockholders) from a miserable marriage! On the other hand, experimenting with alternative business models and ownership structures is an important part of any dynamic market, because markets are not static but represent and ongoing processes of entrepreneurial “discovery.” Thus, policymakers would be wise to avoid micro-managing mergers and instead let things run their course. Sometimes collaboration makes a great deal of sense, especially when the significant costs of providing a media service becomes impossible absent a partnership. Indeed, federal officials and agencies are currently exploring how (or whether) journalism can survive an era of seeming perpetual media upheaval. Healthy media companies certainly must be part of the answer and new ownership arrangements might be part of the solution. Given how difficult it is to predict the future course of events in this chaotic sector, humility—not hubris—is the sensible disposition when it comes to media merger policy. At a minimum, policymakers should insist that ongoing debates are governed by facts instead of fanaticism, because, if the past decade is any guide, discussions about media mergers have been more often rooted in hyperbolic rhetoric and unsubstantiated hysteria. “For regulators, a deal like this is a gift; an occasion to impose their will upon needy companies that would otherwise be outside their regulatory reach.” Craig Moffett, Bernstein Research, Comcast: Snatching Defeat from the Jaws of Victory? Oct. 23, 2009, at 14. Nina Munk, Fools Rush In: Steve Case, Jerry Levin, and the Unmaking of AOL Time Warner (New York: Harper Business, 2004); Kara Swisher and Lisa Dickey, There Must Be a Pony in Here Somewhere: The AOL Time Warner Debacle and the Quest for a Digital Future (New York: Crown Business, 2003). Dean Vows to ‘Break Up Giant Media Enterprises,’ The Drudge Report, Dec. 2, 2003, www.drudgereport.com/dean1.htm; Bill McConnell, Dean Threatens to Break Up Media Giants, Broadcasting & Cable, Dec. 3, 2003, www.broadcastingcable.com/index.asp?layout=articlePrint&articleID=CA339546. John Nichols and Robert W. McChesney, Our Media, Not Theirs: The Democratic Struggle against Corporate Media (New York: Seven Stories Press, 2002) at 31. Richard Linnett, Media Rivals Backslap at Cable Conference, AdAge.com, June 10, 2003. Dennis Wharton, National Association of Broadcasters, NAB Statement in Response to Sirius/XM Proposed Merger, Feb. 19, 2007, www.nab.org/AM/Template.cfm?Section=Search&template=/CM/HTMLDisplay.cfm&ContentID=8258. Peter Whoriskey and Kim Hart, Justice Dept. Approves XM-Sirius Radio Merger, The Washington Post, Mar. 25, 2008, www.washingtonpost.com/wp-dyn/content/article/2008/03/24/AR2008032401645.html. Most of the younger people I know have iPod docks in their vehicles for listening to music. Smartphones are bringing music and podcasts to mobile consumers. E-reading machines have wireless connections that can eventually deliver content on a subscription or pay-per-use basis. I really do not need the sports channels from Sirius if I can watch and listen to the games I want on my phone. As time goes by, satellite radio will be viewed as a stepping-stone technology that was replaced by smartphones and other portable media devices. Michael Wolff, Rupert to Internet: It’s War! Vanity Fair, Nov. 2009, at 112.